The topic may be wintering over your bonsai, but this is also a good time to check and remove wire from your trees. After a long growing period the wire may very well be cutting in to the tree. Also, this is the best time to rewire as the tissues will harden more over the winter and the branches will set better. A little later when trees have defoliated you can wire more easily. Remove the wire before the trees are in full leaf in the spring. In the fall, starting in September, you should switch from high-nitrogen fertilizers to a low-nitrogen one, like 0-10-10 or, if you can’t find that, 4-10-10. (Cactus and succulent fertilizers tend to be pretty low in nitrogen, 2-7-7 for example.) There are two reasons generally given for this change in fertilizing. First, there’s the idea that low-nitrogen feeding will cause the roots to start to harden for winter. However, it might be that correct feeding in spring and summer has more to do with the health of roots than this fall feeding, but there are still plenty of people who swear by it. The second reason to withhold nitrogen in fall is to discourage the development of new growth which’ll probably be too delicate to survive winter anyway. Note that some smart people see no reason for seasonal fertilizing changes at all [Ref]. Your call. Now for wintering over, most hardy species tolerate freezing of the pots. Junipers, pines, and spruce seem like being frozen as long as they are out of the wind. One thing that will damage the roots is constant freezing and thawing or if it never really thaws completely before refreezing. The roots will take on moisture but not be able to pass it through the frozen roots in the center of the pot, and by refreezing will expand and burst. The roots can also be crushed by the expanding soil. Chinese elm and Trident maples have fleshy roots that are at more risk than evergreens, and should have more protection: 35 degrees would be an ideal temperature. If you can’t do that, try to keep a constant temperature, without freezing and thawing every day. I have wintered over Tridents and Elms in the basement, which is around 60 degrees. One disadvantage is that they break bud so early so you have to wait a long while before you can place them outside so not to wind-burn the leaves. I have placed Tridents outside in the middle of May just to get a cold windy night burn the leaves. The best location for your winter hardy bonsai would be a greenhouse or cold-frame, or place your bonsai under your benches and cover with polythene so you can open the ends if it gets too warm and to allow fresh air in. It would also be a good idea to shade the sunny side with a piece of plywood or some other material that will not let in strong sun in. There are so many rules that you could follow but the main thing is to remember to keep them out of the wind. Sun and wind can cause them to dry out even in the winter which will kill finer roots, putting the roots at risk of decaying or root-rot come spring. I put most of my hardy bonsai away as soon as they freeze up completely, otherwise I place them on the ground and try to keep them out of the wind (I know you have heard that enough). 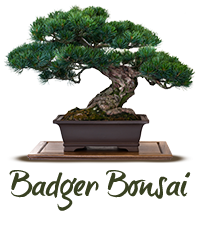 For small bonsai it wouldn’t hurt to take them out of the pot and place them in a box with damp peat. For tropicals the best thing to do is check your indoor bonsai books. Some of them do not like it when it gets below 50 degrees at night and others can handle it almost down to freezing. I will take all of the tropicals inside when I see that the nights are going to be in the 40’s every night. Buttonwoods and other tender species I will take in when it is going to get in the lower 50’s every night, so check to see what you have out there as it is getting colder every night. Switch to low- or no-nitrogen fertilizer for the hardy trees in September. Protecting your trees from the wind is most important. Drying in winter kills, not the freezing. Protect the trees from the sun to avoid a constant partial thaw-refreeze cycle which is hard on roots. Dormant trees do not need light when kept below about 40 degrees F.
Article originally by Bonsai Bob, edited and added to by William A.
I am not real fantastic with English but I come up this really easy to read .